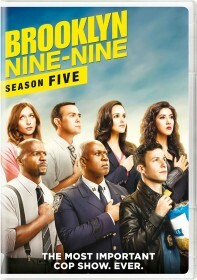 Universal Pictures Home Entertainment will be releasing Brooklyn Nine-Nine: Season 5 on DVD in the United States and Canada on Tuesday, August 28. The three-disc DVD box-set will include all twenty-two episodes of the show's latest season along with deleted scenes from select episodes. The DVD features an English 5.1 Dolby Digital audio track along with English and French subtitles. Brooklyn's finest are back and leveling up! From Jake's new prison friendship with a cannibal, to totally #awk office yoga sessions, and the most unforgettable Halloween heist of all time – there's no place like the Nine-Nine. From Dan Goor and Mike Schur (The Office and Parks and Recreation) come all 22 hilarious, season five episodes of the Golden Globe Award-winning Brooklyn Nine-Nine.